$250 per day and $750 weekly. Unit measures 25″ X 18″ X 12″ weighs 30 lbs. and fits in a small Pelican case..
Shelton Video 2014 from Steve McWilliams on Vimeo for more information about the new EyeDirect. The EyeDirect is a perfect solution for a shoot in a distant location where an experienced technician may not be available. Keep in mind, however, that it is not the same as an Interrotron. Subject’s view of the director. 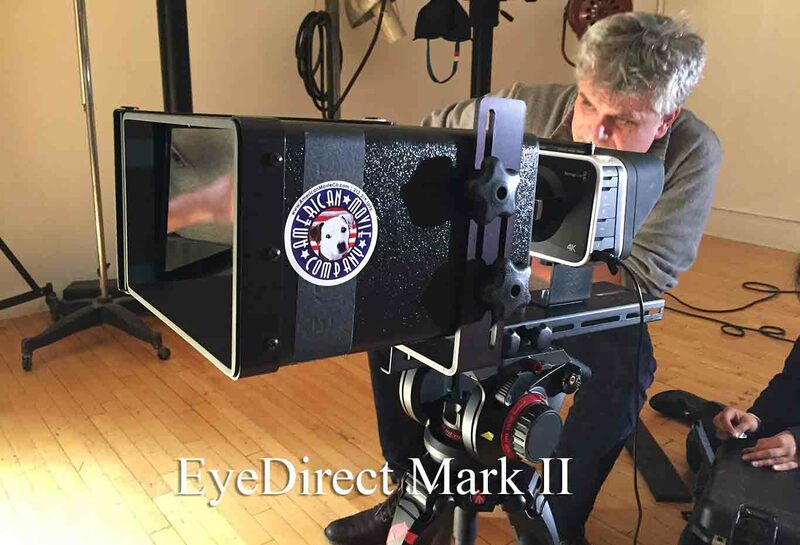 What’s the difference between the EyeDirect Mark II and the Interrotron Mark III? The Mark II is a precision-made instrument with very few moving parts. Consequently, it is a perfect unit to take on the road. It is highly reliable. The unit comes in a custom-fitted road case which offers maximum protection. There is a tablet teleprompter slot incorporated within the Mark II. It takes but a minute to switch from “Interrotron mode” to “teleprompter mode”. Producers can control the tablet with a Bluetooth smartphone or use the “airplay” function of a Mac laptop. By simply inserting a tablet into the slot, one can instantly transform the EyeDirect into a teleprompter. (You simply download teleprompter software) Note: You can rent an iPad preloaded with teleprompter software with your EyeDirect. The unit is so simple to use that it does not require a technician per se. A grip or AC should have no problem getting the unit up and functioning very quickly. Cost. The unit is less expensive to rent than its larger, more professional siblings, the Interrotron Mark III or Mark IV. The professional Interrotron Mark III is a dual unit system. 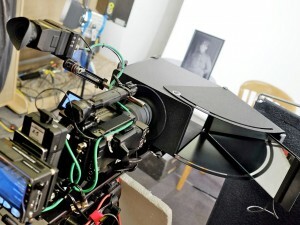 This allows the director to sit comfortably in “video village” while the one piece EyeDirect makes the director stand (or sit) right next to the camera. This often forces the choice between setting the tripod height either to accommodate the director’s comfort or the quality of the shot. 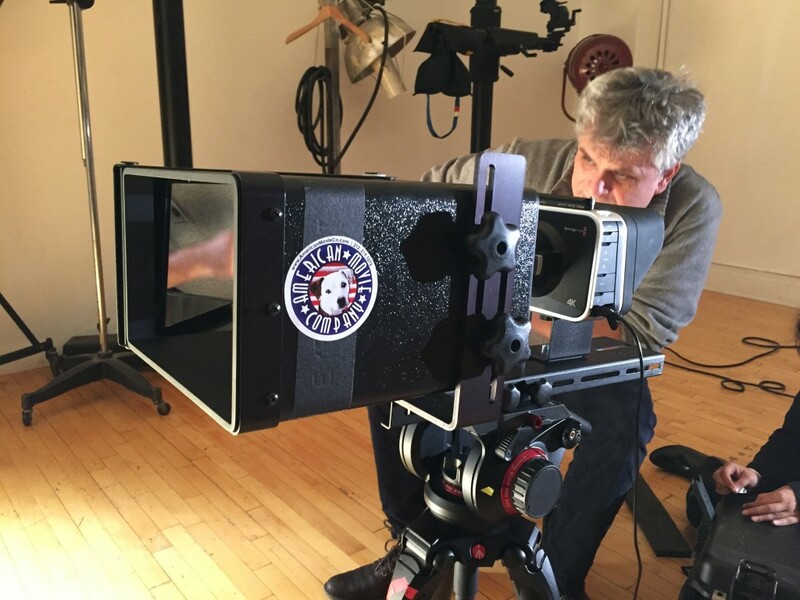 The Mark III has 16 X 9 video monitors so the director sees the subject properly composed for HD and above. The EyeDirect has a standard def aspect ratio. The two video monitors on the Mark III are HD. Mirrors replace the monitors on the Mark II. The Interrotron Mark III has a true professional camera production monitor in which to view the subject. So the director sees just what the lens of the subject’s camera sees. The right focus, the right exposure, the right framing. The director can simultaneously have the best, most comfortable, most accurate, most productive “one on one” conversation with the subject, but also can do so while monitoring every technical aspect of the shot. The subject’s unit is a modified, professional “gold plate” Autocue Teleprompter. It will easily accept Red Dragon, Phantom, Alexa, C300, F35 and virtually every professional camera made on its sliding rod and plate system. The Mark III directly accepts every type of camera output: HDMI, HD-SDI, Component, and Composite. Each has a “pass-through” for additional monitor access. The Mark III is delivered and operated by a professional Interrotron tech who is also an experienced teleprompter operator. The EyeDirect must be picked up from and returned to our studio. The Mark II prompter software is more rudimentary. It needs to be operated by someone who often is not an experienced, professional prompter operator. Like the EyeDirect, the Interrotron can also function as a standard teleprompter. In fact, all of our operators are trained teleprompter technicians so in seconds you can switch from Interrotron mode to prompter mode. The EyeDirect is made for the road. The case is fitted with highly protective density foam to ensure the different parts of the system remain intact. The Mark II comes with a special riser to accommodate a DSLR or small camcorder. The EyeDirect can be picked up in New York, Miami, Toronto and Los Angeles. We can ship it anywhere in the world. The EyeDirect does not require a professional operator. Instructions on how to rig and operate the unit are included in the Pelican case and are sent via email after rental confirmation. 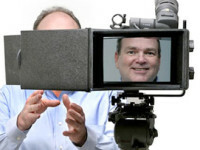 The EyeDirect can also function as an iPad Teleprompter when using the tablet mount that is also included in the case. The EyeDirect rents for $250 per day or $750 for a 3 day week. If you need a bigger monitor or a multifunctional unit, the Interrotron may be a better option for you. The Interrotron Rental NYC package, which includes an experienced operator, rents for $945 for a 10 hour day. The Interrotron can also be used as a Standard 19” Teleprompter. The Mark II EyeDirect (EyeLiner) is the one piece, highly portable, easily transportable, affordable, Interrotron-like solution that does not require a technician. The EyeDirect is available for pickup in New York, Los Angeles, Miami, and Toronto. It can be shipped to you anywhere in the world. We have both the standard Mark II EyeDirect and the folding Mark E EyeDirect. The Mark E is suitable for small camcorders and DSLR’s. It is very light and folds to the size of a laptop case for easy and cost-effective shipping. Rent our Confidence Monitors nationwide.